இனிய புத்தாண்டு நல்வாழ்த்துக்கள்! සුභඅලුත්අවුරුදක්‌ වේවා! Wishing you a prosperous and happy Sri Lankan New year! 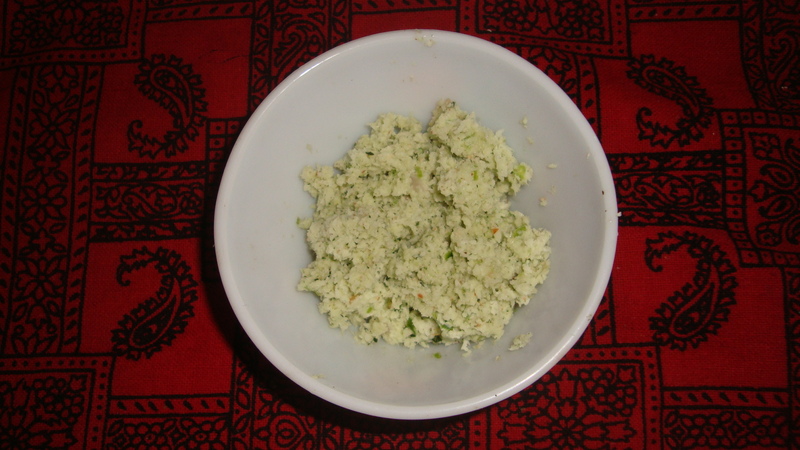 A key dish made today is either Kiribath or Pongal. Other snacks made at my home are Paruthithurai vadai, Murukku and Seeni ariyatharam. I have requested several friends to share the recipe of a dish that they have made for today in their homes and will be able to hopefully share them (particularly that of kavum, kokis etc) soon here. In the meantime, I invite you to my short story collection “Waves” book promotion on the Amazon Kindle store. The book can be freely downloaded during the ongoing promotion till 15th noon (Sri Lankan time). 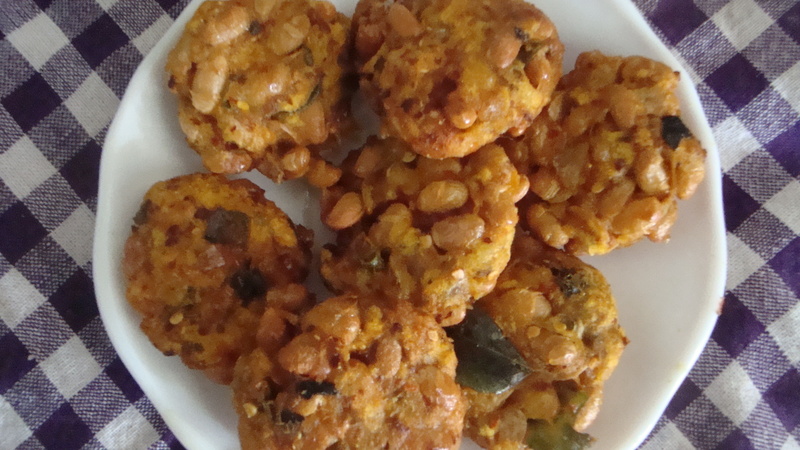 Today’s recipe is a snack made from soya beans – a crunchy soya bean vadai. Mix all the ingredients in a mixing bowl to prepare the ‘vadai’ dough. Divide the dough into small balls, around 6 or 7. Flatten each slightly. Heat the oil in a pan. When the oil is ready for frying, drop the ‘vadai’ in batches into the heated oil and deep fry them until they are golden brown on both sides. Serve warm with some Sri Lankan tea. For today’s specialty food, I would like to share a delicacy from my birthplace – the “Paruthithurai Vadai”. 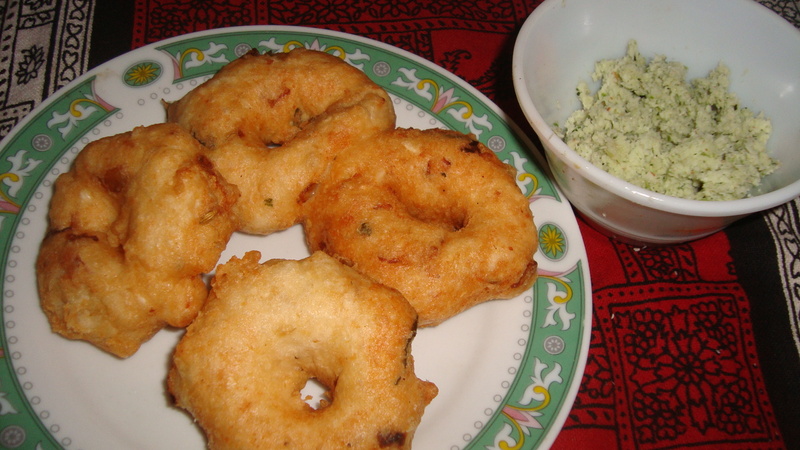 This vadai is generally prepared in Jaffna during festival seasons. While I have had the privilege of trying out this vadai in different places across Jaffna as well as at the homes of friends and relatives, the best, crunchiest “Paruthithurai/Thattai Vadai” that I have eaten to date has been that made by my mother. So, here’s the recipe for it. Soak the split urad dhal for around 6 hours. Drain and peel the skin. In a mixing bowl, add the drained and peeled split urad dhal, wheat flour both steamed and regular, crushed chillies, ground onion, chopped curry leaves, fennel seeds, salt, bringing them together using a little water to make the ‘vadai’ dough. Heat the oil for deep-frying. Do not let the ‘vadai’ dough sit out too long and transfer to the frying pan as soon as the dough has been made and the balls have been flattened into the thin ‘vadai’ shape. Deep-fry the vadai in batches until they are golden brown. Transfer the vadai to a tray lined with grease absorbing paper. The vadai can be stored, for many days, in an air-tight jar. 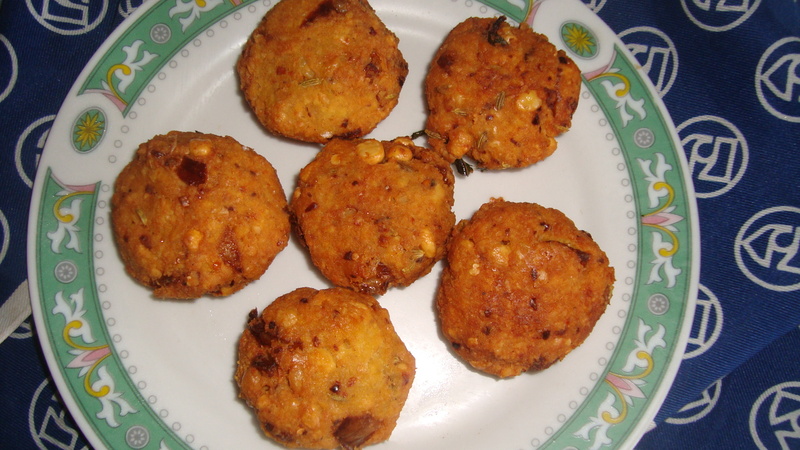 Today’s Navarathri recipe for the third day of the Lakshmi ‘poosai’ is kadalaiparuppu vadai. Soak the de-skinned and split chickpea for about three hours. Drain. Keep aside 3 tbsp and then coarsely grind the remaining chickpea. Mix the coarsely ground chickpea and the 3 tbsp chickpea that had been kept aside. Add the remaining ingredients to the chickpea mixture and mix well. Divide the seasoned chickpea mixture into 6 balls. Heat the oil in a round-bottomed frying pan or wok. When the oil is ready, drop the chickpea balls into the sizzling oil. Fry for about two minutes each side, ensuring that each ‘vadai’ is lightly browned on all sides. Remove the ‘vadai’ from the pan and transfer to a plate lined with grease absorbing paper. My mother remembers having this prawn snack from her childhood days and even better, the way her mother used to make it. Clean the urad dal and let it soak in a bowl of water for 3 – 4 hours, or overnight. Clean the prawns. Rub some salt over them and boil the prawns in some water for about 10 mins. Drain the urad dal and grind it together with the chopped chillies and onion till the batter is just right for vadai. Add some fennel seeds and salt, to taste and mix well. Dab some oil on one of your palms. Take a small ball of batter and flatten it slightly on your palm. Place one of the cooked prawns in the middle of the batter and close it up, forming a ball again. Flatten the ball of batter again, into the shape of a vadai and make a small hole in the middle, like a mini-doughnut. Deep fry the prawn vadai. Serve with some hot tea. Black gram, or urad dhal, plays an important role in the cuisine of the north. It is one of the gram varieties cultivated in the seasons in between paddy cultivation and is a major source of nutrition. Today, I will share my mother’s recipe for her famous vadais as well as a green gram snack in my next post. 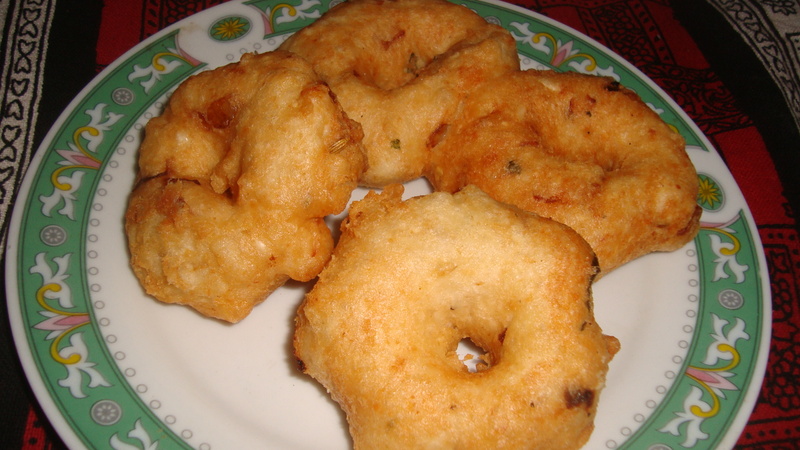 Vadai can be breakfast food or a tea-time snack or can be served with lunch or dinner. 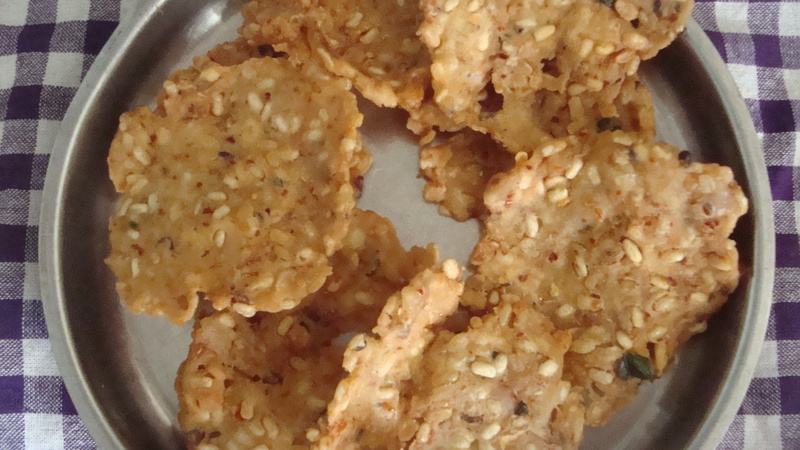 It is the most common snack under the Tamil cuisine of the country and is quite popular around the country. Grind with a little water to thick batter. Heat ½ l oil in the pan. Mix and grind all ingredients and add salt, to taste.